By Terry Dunn on Dec. 3, 2014 at 1:06 p.m. 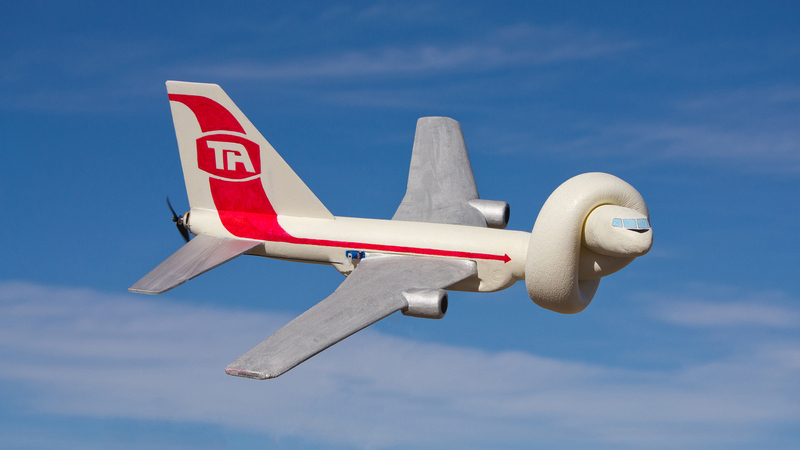 Passenger airlines are not the most popular models in the RC community, but here are a few ways to tackle the task of building one to fly! Most of us can look skyward at any given time and spot at least one airliner streaking overhead. In fact, there are around 7000 passenger-hauling aircraft registered in the US…a large percentage of which are airborne at this very moment. If we assume that the average airliner logs about 10 hours of flight a day, 300 days a year, it’s no wonder we see them so frequently. I find it a little odd that these aircraft which are so prevalent in our daily lives are very infrequent RC modeling subjects. Perhaps it’s a case of familiarity breeding contempt. Or maybe it’s that most modelers find more excitement in emulating gun-slinging warbirds or wing-bending acrobats. For those modelers who do find passenger planes alluring, there are a few options to help you scratch that itch. ALTHOUGH THERE ARE SIGNIFICANT DIFFERENCES FROM THE AIRPLANE DEPICTED ON THE MOVIE POSTER, I THINK THE KNOTTED FUSELAGE ALONE IS SUFFICIENT TO INVOKE THE INTENDED RESPONSE WITH THIS NOVELTY RC FLYER. 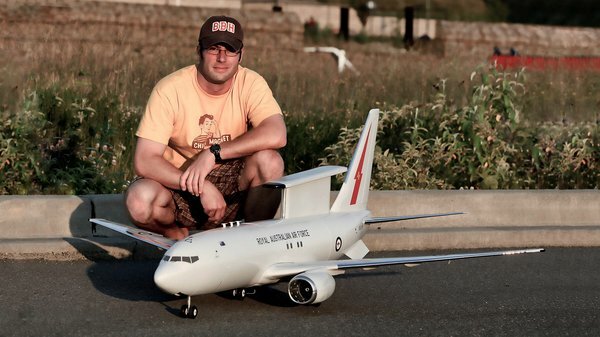 Doug Wilson of Seattle has built several very convincing airliner models. All of his projects are based on kits of the Boeing 737 from Windrider. These molded foam models have an extremely accurate scale outline. Spanning nearly 75”, they are rather large as well (about 1:19 scale). Whereas the full-scale 737 is powered by turbofan engines, Doug’s models are each propelled by a pair of Electric Ducted Fans (EDF). An EDF is basically an impeller (driven by an electric motor) within a shroud. It’s something like a turbofan minus the combustion. 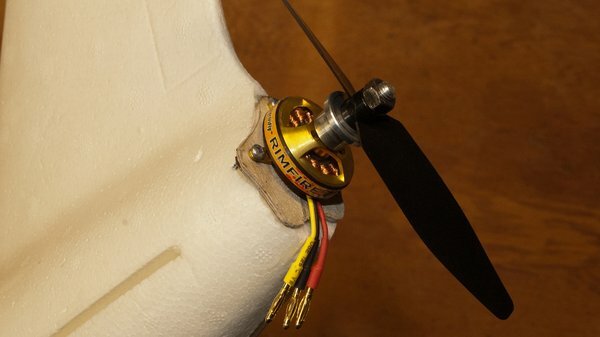 Although EDFs are typically less efficient than an equivalent propeller-equipped setup, they are capable of impressive thrust and speed when properly configured. The jet-like footprint of EDFs makes them a popular choice for scale models of jet aircraft, as well as sleek, go-fast, sport models. The EDFs in Doug’s models are 70mm diameter units with HET 2W-20 brushless motors. Each motor is controlled by a 75-amp Electronic Speed Control (ESC). A single 4S-5000mAh lipo battery powers the pair of EDFs in each model. While the stock Windrider models are impressive enough, Doug took his models to a whole new level with extra scale details. Each model has a full set of operating external lights that match those on the full-scale 737. If you’ve ever been seated above the wing of an airliner, you may have noticed how the flaps on the back of the wing slide both backwards and downward before landing. Those are called Fowler Flaps. Doug’s 737s have those too. The 737 has been around for nearly 50 years, so there are numerous variations of the basic design. The Windrider models emulate the -700 version of this iconic airliner, but Doug wanted something a little different for his two most recent projects. The Wedgetail is a military version of the 737 used by the Royal Australian Air Force as an early-warning radar platform. The radar is housed in a large T-shaped protrusion on top of the fuselage (the wedge). Doug added this defining feature as well the twin ventral fins (on the bottom of the fuselage) that make the Wedgetail unique among 737s. The 737-800 is an elongated version of the -700. To create this version, Wilson scratchbuilt two fuselage sections totaling almost 12 inches and blended them into the stock fuselage. One section was placed forward of the wing, the other, aft. The resulting airplane is 81” long. Doug completed his model by decking it out with Alaskan Airlines livery. 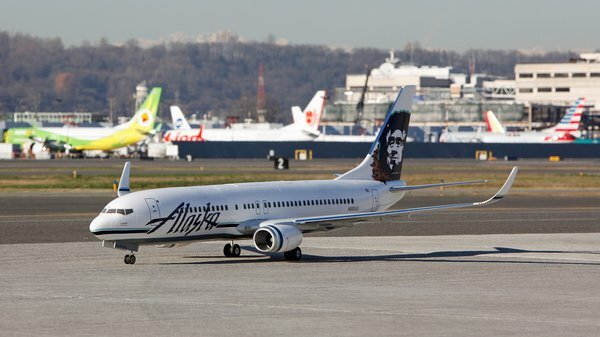 As with his other 737 models, the graphics are adhesive vinyl sourced from Callie Graphics. When Jason Hill of Edmond, Oklahoma decided that he wanted an airliner model, he elected to build it from scratch. His model is a 1/16-scale 737-300 that is made almost entirely of extruded blue foam. Jason made templates for each part of the airplane and then cut the corresponding foam pieces using a homemade hotwire rig. What I found most interesting about Hill’s construction technique was his approach to creating the tubular fuselage. When faced with this task, many modelers would have created a series of cylindrical sections and glued them end to end to get the desired length. Hill, however, created quartered cylinder parts that were the full length that he needed. This left him with just four glue joints to create the tube…clever. When all of the blue foam parts had been completed, Jason sheeted them with 1/16” balsa. This can be a tricky and time-consuming task when dealing with compound curves. The final layer of structure on the 737 is a layup of fiberglass cloth with finishing epoxy. 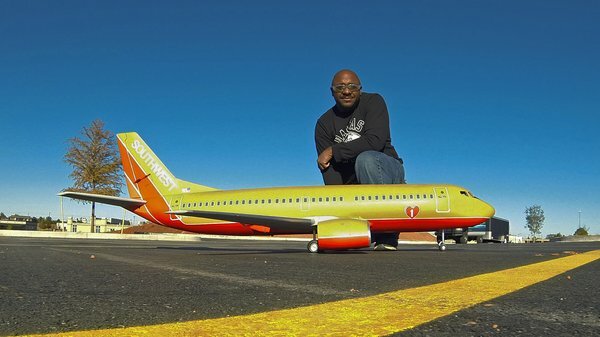 He painted the model using latex paint and also utilized Callie Graphics to create the Southwest Airlines motif. I thrive on creating unique flying machines. Even when working in an underserved genre such as airliners, I always feel compelled to do something a little bit different. My first thought in this regard was to create a model of the Boeing 707 in Trans American Airlines colors. Trans American is the fictional airline from the 1980 comedy classic Airplane!. Very soon after starting my research into this subject, I realized that I wouldn’t be happy with just a Trans-American 707. If I was going to create any model based on Airplane!, it would have to be the knotted-up caricature of an airliner featured on the movie poster. Self-imposed challenge: accepted. THE CORE OF MY AIRPLANE! PROJECT WAS A SIMPLE FOAM CHUCK GLIDER FROM A TOY STORE. NOTE THE SIZE OF THE STOCK VERTICAL STABILIZER. The core of my model is actually a kid’s backyard foam “chuck glider” that you would find at a toy store. Specifically, this glider is a discontinued model once made by Life Like (now LIFOAM Industries) that came with stickers to make it look like an American Airlines Boeing 757. The core of my model is actually a kid’s backyard foam “chuck glider” that you would find at a toy store. Many chuck gliders can be easily converted into great electric RC park fliers. Many chuck gliders can be easily converted into great electric RC park fliers, and this is one of the best. I’ve built several different RC models using this glider and found it to be very adaptable and tolerant. The specific glider I used here is one that I squirreled away when I learned that they had been discontinued. I’d been saving it for a special project, and this one seemed worthy. 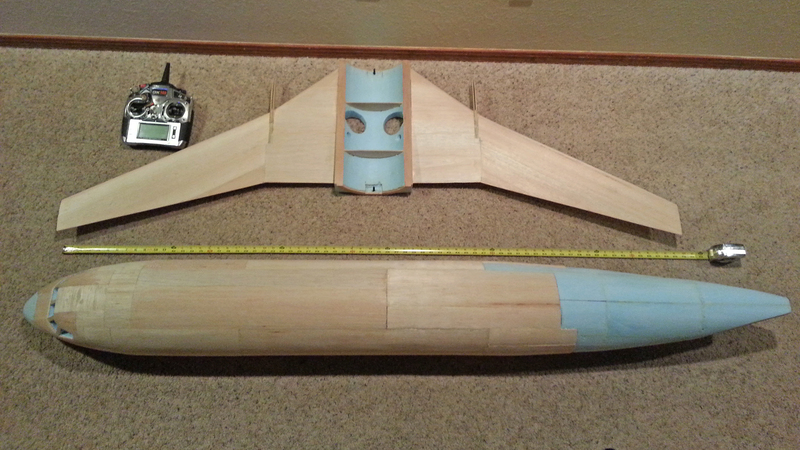 The stock glider is quite robust, but the wing requires stiffening to tolerate the loads it will see as a RC model. I simply added a single strip of 2”-wide strapping tape (aka filament tape) span-wise to the bottom surface of each wing panel. After that, I glued the wings in place with a small amount of Gorilla Glue. I made oversized horizontal stabilizers out of 5mm-thick sheet foam and hinged the control surfaces with Blenderm medical tape (great stuff). A Hitec HS-55 servo is attached to the control surface on each half of the horizontal stabilizer. These two control surfaces (commonly called “tailerons”) work in unison to provide both pitch and roll control, which is all this model needs. THIS RIMFIRE 250 BRUSHLESS MOTOR IN THE TAIL PROVIDES AMPLE AND WELL-CONCEALED THRUST FOR THE TWISTED AIRLINER. I powered my airliner with a single Rimfire 250 brushless motor hidden in the very tail of the airplane. I cut a simple firewall out of 1/16” plywood and epoxied it into place. The motor was then attached to the firewall using #2 screws. I attached a 5x4.3 propeller to the motor. The Rimfire is controlled by a Flight Power 6-amp ESC and powered by a 3S-500mAh lipo. With the motor so far aft, I had to extend the leads of the ESC. In these situations, it is always better to extend the motor leads from the ESC rather than the battery leads. (The reasons for that are out of scope here, but trust me on this one.) I extended the three motor leads by soldering about 1’ of 18-gauge stranded wire to each. Before mounting the Futaba R6004FF receiver or battery, I taped them in various places to determine their best orientation. My goal here was to maintain the same balance point (Center of Gravity, aka CG) that the model had as a glider. By carefully positioning these components, I was able to preserve the desired CG without adding any ballast. I hollowed out pockets on the bottom of the fuselage to mount the various components. A sanding drum in my Dremel tool made quick work of that task. My plan was to first fly my project as a conventional-looking airliner before adding the telltale knot--a feature of dubious aerodynamic qualities. This would allow me to exercise the power system and controls with fewer variables in the mix. This plan would also allow me to address any balance or trim issues. With no knot or paint, the first flying stage of this project was only 10.7 ounces ready-to-fly--my lightest conversion of this glider by far. With no knot or paint, the first flying stage of this project was only 10.7 ounces ready-to-fly--my lightest conversion of this glider by far. To be fair, my previous conversions used dual brushed motors and NiMH batteries. Yet, they still flew well at 17+ ounces. I logged two flights with the model at this stage. I found it to be very relaxing and easy to fly. The single brushless motor provided plenty of power. The control surfaces worked well for cruising around the field, but their authority stopped a bit short when I tried aerobatics other than loops. 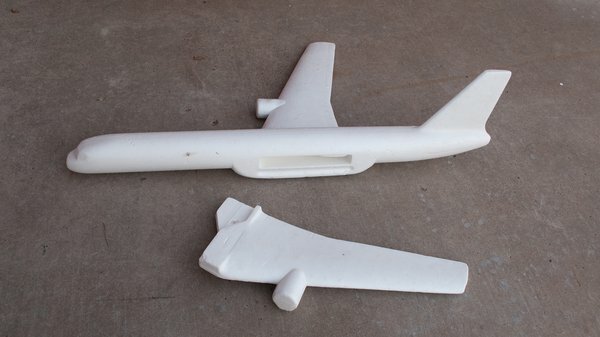 I took the model back to my shop and quickly lopped off the forward part of the fuselage. That way, I would have no second thoughts about continuing to the next stage. I expected that the knot in the fuselage would be the defining feature of my model, so I felt justified in taking numerous artistic liberties with the rest of the build. I am rarely accused of being too detail-oriented with my projects and this build provided ample supporting evidence. Even though I was starting with a model that closely resembled the twin-engined 757, I didn’t feel compelled to make it more 707-like (which has four engines). Fake jet engines notwithstanding, let’s not forget that my model is actually powered by a single propeller. For the sake of simplicity, my plane incorporated some big deviations that I hoped would be forgiven by aircraft-astute readers. 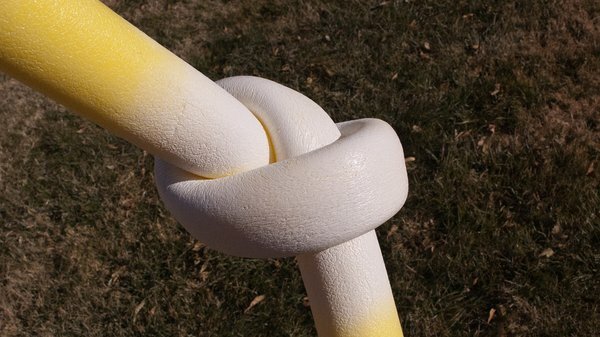 THE KNOT IN THE FUSELAGE WAS MADE BY MANIPULATING AN APPROPRIATELY-SIZED POOL NOODLE. THE PRIMER BEING APPLIED HERE DIDN’T STICK TO THE FOAM. Creating the knot was actually rather easy. It’s just a foam pool noodle that I physically contorted. The real trick was locating a pool noodle that was the same diameter as the airplane fuselage (about 3”) and also had a smooth outer skin. Most of the noodles that I found were either too small or they had a sponge-like open cell surface. Either condition was a deal-breaker. Creating the knot was actually rather easy. It’s just a foam pool noodle that I physically contorted. I tried adding a coat of primer to the knot before attaching it to the airplane. I quickly figured out that the primer wouldn’t stick. I later figured out that pretty much nothing sticks to pool noodle foam. I’ll just have to do a lot of touchup work over the life of this model. I glued the knot to the severed fuselage just ahead of the wing and also glued the nose to the other end of the knot. The noodle material is rather heavy, so adding the knot increased the airplane’s weight by almost 3 ounces. This forced me to move the battery rearward to maintain the CG. I used latex craft paint to apply a simplified version of the Trans American motif. Once the paint dried, I was excited to go see if this beast would still fly…it didn’t. My first three launches of the airliner resulted in mostly uncontrolled descents back to the ground (aka crashes). 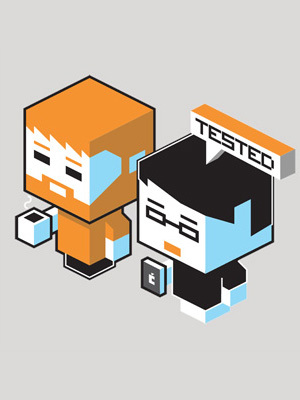 Its behavior confirmed a nagging suspicion I’d had during the build, but hoped would prove false. The knot severely affected the airplane’s lateral stability. It was essentially flying (or not flying) like an arrow with no fletchings to guide it. In other words, it couldn’t maintain its vector, Victor. By the fourth launch, the knot and the nose were being held on with tape while the vertical stabilizer had been enlarged with scraps of sheet foam (also taped in place). Despite its Frankenstein appearance, the model now flew predictably and under full control. I made the necessary repairs to the airliner and fashioned a new vertical stabilizer that was more than double the size of the stock bit. Subsequent flights have shown that my testing was no fluke. It still flies just fine. With the knot up front and the huge tail, my novelty airliner gets knocked around by the wind rather easily. You can see this characteristic in the video, which was shot on a windy day. The drag of the knot also requires more power to keep the airplane flying. In my flights before adding the knot, I seldom used more than 1/2-throttle. With the knot, I rarely use less than 3/4 –throttle. Overall, I’m very pleased with how my airliner turned out. My primary goal was to create a unique and airworthy airliner, and that’s what I ended up with. My only regret is that I’m now out of my favorite chuck gliders to use for future projects. Even if airliners are not always an obvious choice for RC modeling subjects, I hope that the examples shown here have provided you with some insight into the opportunities within this often overlooked genre. As with any overview, there is much more to be seen. Some airliner models not mentioned here are pure gliders. Still others are powered by turbine engines. Whether your tastes lean towards the ultra-refined or the whimsical, there is probably an airliner to fit your need. My thanks to Doug Wilson and Jason Hill for sharing details and photos of their impressive airliner projects.